Jeffrey Traister is a writer and filmmaker. For more than 25 years, he has covered nutrition and medicine for health-care companies and publishers, also producing digital video for websites, DVDs and commercials. Trained in digital filmmaking at The New School, Traister also holds a Master of Science in human nutrition and medicine from the Columbia University College of Physicians and Surgeons. For centuries, people worldwide have used sulfites to preserve foods and beverages. Shellfish handlers use sulfites to preserve shrimp. However, eating shrimp that contains sodium sulfite is potentially hazardous to your health if you are allergic to the shellfish. Consult your doctor about the dangers of sodium sulfite and shrimp. Preservatives inhibit the growth of harmful microorganisms and retards the spoiling of foods, so they look and taste fresh. Sodium sulfite, sodium bisulfite and sodium metabisulfite are part of a family of sulfites that have antioxidant properties that manufacturers add to foods and beverages to prevent oxidation -- a chemical process that spoils food. The foods and beverages that manufacturers use sodium sulfite with include shellfish, potatoes, dried fruit, vinegar, wine, beer and fruit juice. The post-harvest procedures for shrimp include adding sodium bisulfite to maintain product quality. Food safety is not a significant concern among shrimp handlers because shrimp do not normally contain toxins, are not usually eaten raw and pathogenic microorganisms are killed by cooking. Sodium bisulfite blocks an enzyme in shrimp that causes melanosis, also called black spot -- a darkening of pigments in the membranes and meat under the shell that makes the product appear unappetizing. Shrimp farmers dip baskets of shrimp after they are caught into a solution of sodium bisulfite to maintain a healthy appearance. Sulfites destroy vitamin B-1 in foods and increase health risks in certain individuals sensitive to the preservative. Sulfites caused the deaths in at least 12 individuals during the 1980s and scientists estimate that many more deaths in earlier decades occurred as a result of sulfite sensitivities, according to the Center for Science in the Public Interest. The Food and Drug Administration requires manufacturers to list sulfites on the labels of products. Scientists at the Center of Food Safety and Applied Nutrition note the FDA prohibits use of sulfites on fresh fruits and vegetables, but allows it to be used in other foods as long as it is declared on the product label, according to research published in the "Journal of Food Protection" in 2004. 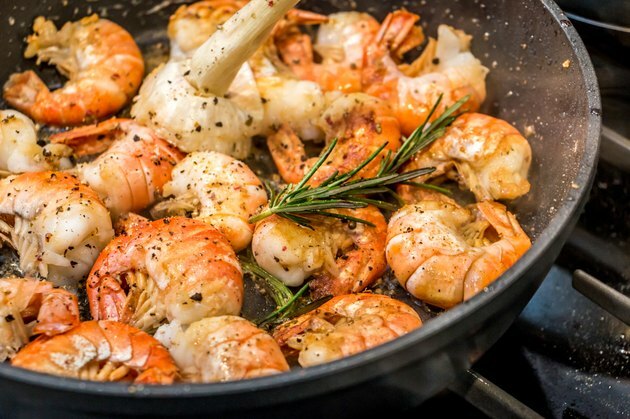 The FDA restricts the amount of sulfite residue on all shrimp to 100 parts per million, while other countries have limits that range between 60 to 100 ppm for raw shrimp and as low as 30 ppm on cooked shrimp. Asthmatics can have life-threatening reactions from exposure to sulfites in shrimp. The symptoms range from mild wheezing to anaphylaxis, a quick, severe and life-threatening allergic reaction characterized by difficulty breathing, anxiety, confusion and fainting. Most reactions occur from inhaling sulfur dioxide generated from sulfite containing foods or beverages during eating. Is Sodium Bisulfite Harmful to Your Health? Can People Have a Reaction to Sodium Nitrite? Can Sulfites in Wine Cause Joint Pain?